Invisalign is a modern and discreet approach to straightening teeth that uses a series of custom-made aligners created to fit snugly over your teeth. The aligners are made from a clear, lightweight material, offering a comfortable and almost invisible alternative to traditional metal braces. They work by gradually shifting your teeth into their desired positions, leaving you with a straighter and more beautiful smile that you’ve always dreamed of. Comfort: Metal braces can cause some discomfort because they use greater pressure to straighten the teeth. 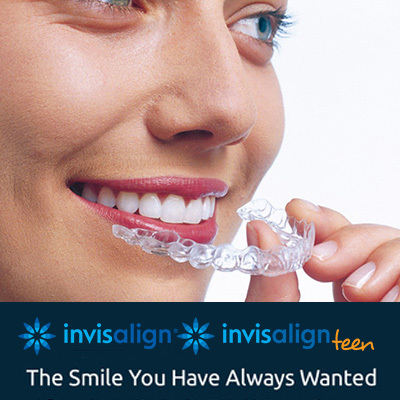 Invisalign applies gradual pressure and uses smooth, comfortable aligners versus metal wires and brackets. Discreet appearance: Because the aligners are virtually transparent, most people won’t notice you’re wearing them. Ability to remove: As Invisalign aligners are removable you can eat whatever you want without having to be concerned with food getting stuck in your braces. Plus, brushing and flossing are much easier. Your Invisalign treatment will begin with an initial consultation with one of our professional dentists where they will create a 3D image of your teeth in just minutes using our high-tech iTero scanner. This avoids the need for gooey impressions, plus it produces much more accurate results. Another benefit of our 3D scanner is that it has an Invisalign Outcome Simulator, letting patients see what their results will look like before treatment has even begun, along with how the teeth will gently move into place during each custom aligner stage. Once your set of custom aligners has been created, you will be able to wear a different set every two weeks to move your teeth into their new positions. You are advised to wear the aligners for at least 20-22 hours per day, only removing them to eat, drink, or brush and floss your teeth. On average, Invisalign will take just one year to successfully straighten a patient’s teeth (a significantly shorter time frame than the 2-3 years required for traditional metal braces). During your treatment, you will also be required to attend regular dental appointments so we can manage your progress. How much does Invisalign cost? As every patient’s treatment plan is different, the cost will vary from person to person. Once your dentist assesses your situation and identifies if you’re a suitable candidate for Invisalign, we’ll be able to give you the exact fee that you can expect to pay. Do you offer payment plans? Yes; we are pleased to provide patients with convenient payment plans to make the dental care you need and desire affordable. Contact our Kippa-Ring practice today to book an appointment!